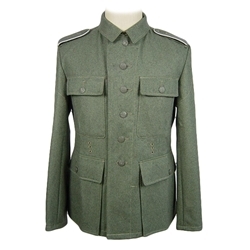 Reproduction of the German service WWII M46 Tunic issued to the Heer and Waffen SS through the end of the war. Excellent quality wool fabric and color. Piping colors vary, sorry no choice. WWII M43 Tunic with non-pleated pockets, 3 eyelet belt hook provisions, hook and eye at the collar and metal buttons. Wool fabric, color and twill lining are excellent quality. U.S. Sizes.